The 224-foot-tall booster soared away from Cape Canaveral's Complex 40 launch pad at 11:15 a.m. EDT (1515 GMT) Monday. The all-white launcher turned northeast from Florida's Space Coast, arcing over the Atlantic Ocean atop 1.3 million pounds of thrust and dispatching a rumble heard for miles around. 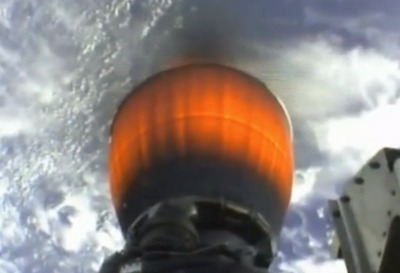 Two minutes and 38 seconds after liftoff, the Falcon 9's first stage shut down its nine Merlin 1D engines and separated from the rocket's upper stage, which ignited a single Merlin engine fitted with a vacuum-rated expansion nozzle glowing red-hot from the fiery combustion of liquid oxygen and RP-1 kerosene propellants. The second stage and its six attached satellites reached orbit less than 10 minutes after liftoff. The six Orbcomm satellites mounted on adapter rings built by Moog Inc. atop the launcher deployed in a 20-minute sequence. SpaceX and Orbcomm officials declared the launch a success with the on-target delivery of six Orbcomm satellites to an orbit about 400 miles above Earth. 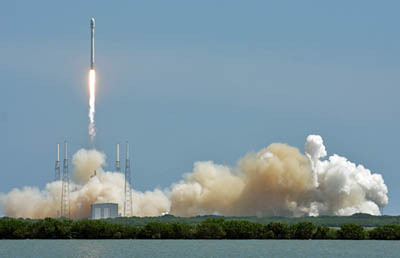 The flight was supposed to take off in early May, but persistent technical issues with the Falcon 9 rocket and the Orbcomm satellites kept the launcher grounded until July. Marc Eisenberg, Orbcomm's chief executive, posted an update on Twitter confirming the successful separation of the satellites. "6 for 6! Thanks SpaceX! Thanks Moog! We'll take it from here," Eisenberg tweeted. Eisenberg later tweeted all six satellites "checked in" with a ground station in Australia, confirming they were functioning following Monday's launch. The satellites were supposed to extend their power-generating solar panels and a boom antenna in the first few hours after launch, then begin a checkout by Sierra Nevada Corp. and Boeing Co., builder of the spacecraft and their communications payloads, respectively. The satellites should begin machine-to-machine communications and maritime tracking services within 60 days of launch, according to an Orbcomm press release. 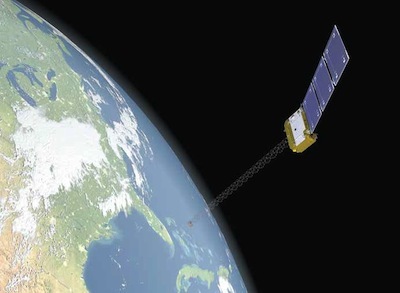 Artist's concept of an Orbcomm OG2 satellite in orbit. Credit: Sierra Nevada Corp.
Before the rocket's second stage reached orbit, the Falcon 9's booster stage lit three of its engines to start a controlled descent to the Atlantic Ocean, targeting a zone a few hundred miles northeast of Cape Canaveral. The 12-foot-diameter stage was supposed to extend four carbon fiber and aluminum honeycomb landing legs moments before falling into ocean. The rocket's engines are designed to adjust their throttle settings to achieve a gentle splashdown. A recovery team was stationed near the expected splashdown zone to retrieve the Falcon 9's first stage, but SpaceX founder and CEO Elon Musk said the rocket landed with a "kaboom" and disintegrated. "Rocket booster reentry, landing burn & leg deploy were good, but lost hull integrity right after splashdown (aka kaboom)," Musk tweeted. "Detailed review of rocket telemetry needed to tell if due to initial splashdown or subsequent tip over and body slam." Airborne trackers on Musk's private jet and a NASA WB-57 reconnaissance plane were also in the area to monitor the rocket's return. The first stage recovery experiment was a bonus objective on Monday's flight, which was part of a $42.6 million two-launch contract package purchased by Orbcomm at a discount from SpaceX's advertised Falcon 9 launch prices. SpaceX wants to eventually make the rocket reusable, and the first step toward that goal is demonstrating the technical and economic viability of retrieving a used Falcon 9 first stage, refurbishing it and flying it again. The Falcon 9's first stage landing legs will allow SpaceX to fly back the rocket to a return pad near the launch site on future missions. SpaceX aims to reduce the landing error with initial controlled splashdowns in the ocean before attempting a vertical touchdown on land. The company also built two prototype Falcon 9 first stages used on short takeoff and landing hops at a test site in Central Texas to prove the rocket's descent and guidance systems. SpaceX's previous launch in April was the first time a Falcon 9 rocket flew with landing legs. Officials said the first stage achieved a soft, low-speed splashdown in the Atlantic Ocean, but heavy waves battered and destroyed the vehicle before ground crews could get to it. While SpaceX's reusability experiments command much interest, the primary purpose of Monday's Falcon 9 mission was to replenish Orbcomm's aging satellite fleet. With six satellites launched Monday and 11 more spacecraft on the way, Orbcomm expects its 889,000 subscribers will see better service in the coming months. The 17 satellites make up Orbcomm's second-generation, or OG2, constellation. Orbcomm officials say the company's investment in the second-generation satellite fleet is worth approximately $230 million. Eisenberg said the launch contracts were converted from SpaceX's discontinued Falcon 1 rocket to the more capable Falcon 9, but SpaceX gave Orbcomm a discount, keeping payments in line with the initial deal for Falcon 1 missions. The six Orbcomm OG2 satellites, each weighing about 375 pounds, were supposed to launch into one of four orbital planes occupied by Orbcomm's communications satellites. The new platforms will join 25 operational first-generation Orbcomm satellites, plus a pair of small ship-tracking spacecraft used by Orbcomm. Built by Sierra Nevada Corp., the satellites are designed for a 10-year lifetime. Subscribers use the satellites to relay status updates, location pings, commands and other data between companies and far-flung trucks, ships, rail cars, oil and gas infrastructure, weather buoys and research stations. Orbcomm says the new constellation of satellites is fully compatible with existing ground terminals. The company offers a new modem with the same interface as a legacy modem to be plugged into customers' equipment. The satellite operator's clients include household brands such as Caterpillar, Wal-Mart, Volvo, Tropicana, General Electric. Orbcomm says it focuses on the commercial transportation, heavy equipment, industrial fixed assets, marine, and homeland security industries. Orbcomm says its customers will see benefits from the launch, including reductions in the time it takes to transfer messages. Full exploitation of the OG2 system's upgrades, such as 24-hour near real-time service, larger message capacities, and greater geographic coverage, will come after Orbcomm's next 11 satellites launch later this year on another Falcon 9 rocket. One of Orbcomm's orbital planes is almost vacant, Eisenberg said, and five of the six spacecraft aboard Monday's flight are destined to occupy that plane. The other spacecraft will drift into another part of the constellation. "There is a specific hole in the sky that we're going to fill, which is why it's going to be material to the service that we offer today," Eisenberg said in an interview before the launch. "We've been waiting to plug it for a long time. There are going to be a lot of excited customers."